thanks for mentioning my tutorial! 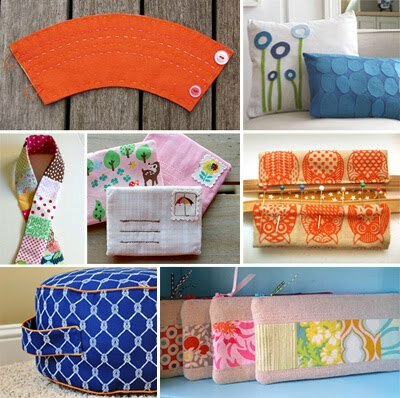 that floor cushion is so on my to do list-have the fabric, just need to sew it. Thanks for your awesome tutorials, ladies! Oh my gosh, that's me! I REALLY need to get over my fear of my sewing machine! i'm loving all these projects. too cute! I love the letter needle books, just had an idea to modify that project! BTW - your fabric makes an appearance in the fall 2010 Stitch magazine, in case you didn't know it! Didn't know it! I'll have to check it out. Thanks for the tip! I made one of the letter needlecases for a friend's birthday. Easy, super cute and a good tutorial. very cute post... love DIY's!!! I feel great throughout your blog, which is nice. You have some beautiful photos and ideas. Not all orange things but all SO cute, thanks for gathering! Yes, somehow I haven't managed to convince the entire internet to make EVERYTHING orange yet. I'll work on it. These are going on my "things to make my friends for Christmas gifts" list. Thanks for sharing! Such fun ideas! Thanks for sharing! Stuck in Suffolk on a rainy day - this is the silver lining, thanks so much!